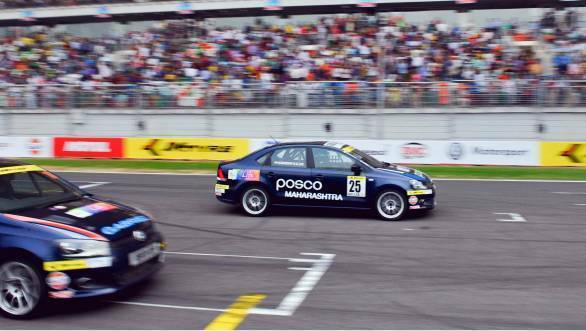 The Volkswagen Vento Cup witnessed an action-packed set of races on Day 2 of Round 3 of the championship that was held at the Buddh International Circuit. During the first race of the day, Karminder Singh tasted victory in a hard fought battle. The Delhi-based driver started the race from sixth place, but he didn't stay there too long. Within the first two laps, he gained positions to move into first place, which he defended till the end of the race. Ishaan Dodhiwala in the meanwhile held on to his second place while Prabhanj Parchuri made his way to the third spot. This was one place ahead of Anindith Reddy, who, having started the race eighth, finished fourth. 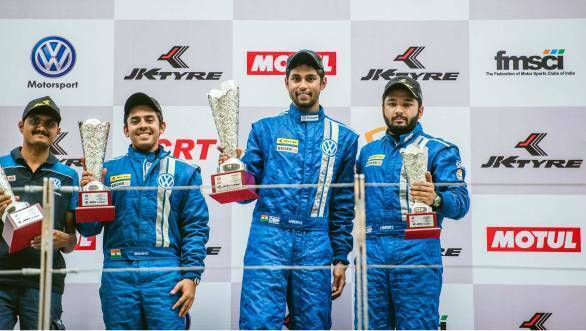 For the second race of the Vento Cup, Anindith was on pole position. However on the second lap of the race, the Safety Car was called for. Post the Safety Car period Anindith had to fend off tough competition in the form of Ishaan. Behind them, inaugural Polo Cup winner Sailesh Bolisetti was fighting for the third position with Karminder. The duo traded positions quite a few times before Karminder crossed the finish line ahead of Sailesh. But, as fate would have it, a post race inspection revealed that Karminder had exceeded track limits and was penalised, landing him in fourth position. This is the first podium finish for Sailesh in this season. And it might just be his last season of the racing, because the driver plans on concentrating on his budding acting career next year. The next and final round of the championship takes place at the BIC between Nov 27-29, 2015. The trio of Karminder, Anindith and Ishaan are touted to be the hot favourites for the championship.